The Echo1 A.S.R Airsoft Spring Sniper Rifle is a weapon that will strike fear into opponents on the battlefield. 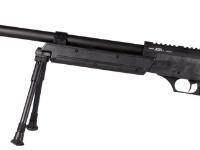 This spring-powered gun features a 22 Rd magazine, a shot velocity of 460-470 fps (using .20g BBs) and 420-440 fps (using .25g BBs), and a metal rail for mounting optional rifle scopes. 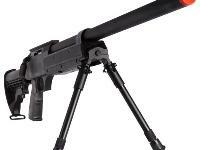 The rifle also comes with a detachable metal bipod for increased shot accuracy. 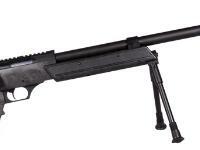 Airgunners will enjoy the ease of use and excellent firing power of this awesome rifle. Take aim and fire today! 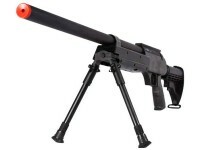 The Echo1 A.S.R Airsoft Spring Sniper Rifle includes three magazines, bipod, speedloader, two allen keys, and cleaning rod. 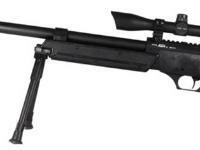 Upgrade Parts Available (Item#: Echo1-ASR-Kit) Upgrade Parts increase rifle to 450-470 FPS with 0.25g BBs. Includes: Two magazines, bipod, speedloader, two allen keys, cleaning rod & threaded left-handed cocking handle for ambidextrous shooting. Things I liked: Extendable crane stock (not every shooter is the same size), top rail length for different size scopes, bolt easy to manipulate, bi-pod is good quality construction (but also has a Con, explain below), FPS is OUTRAGEOUS but best with .28 and higher, shoots hard..... silent..... and accurate! Things I would have changed: Sling mount on stock should be swivelable (is that even a word?) to which I mean it should be able to swivel instead of being fixed. Im afraid it'll break on me one day. The bi-pod is a bit wobbly when attached and makes too much noise when trying to move stealthily thru the woods to PEW the opposing team. Maybe a front underside rail mounted bi-pod wouldve been better instead of this slide-over-the -post type?! What others should know: I mentioned that the bolt was easy to manipulate, I speak as an adult. It may be harder for anyone under 13 years of age to pull back fully. Things I liked: The gun is very quiet. M4 adjustable style stock and hand grip is awesome. Bi-pod is easily adjustable. 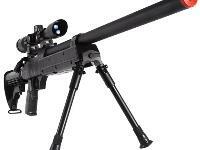 Once hop-up and scope are set, the gun is deadly accurate, I can hit a barrel 200ft away and further once they were adjusted. Comfortable trigger pull. 3 mags are always a plus. Things I would have changed: The area of where you have to adjust the hop-up. It's on the under side of the gun near where you put the mags in, but it's not too hard to adjust. What others should know: A 6.01 TBB would give this gun even more accuracy and range, which I am going to put in soon. If you get the upgrade kit, upgrade the sear in the trigger box to keep it from breaking under the pressure of the more powerful spring. Great gun overall.